The new, solar photovoltaic installation, and some of the recently installed double glazed windows, can be seen in this image of the Springtime Studios building in Cape Town where the CER’s offices are located. 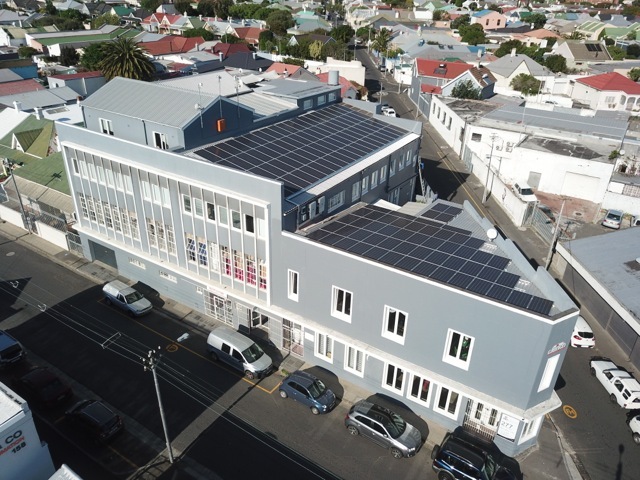 A new, rooftop solar photovoltaic (PV) installation on Springtime Studios, the Cape Town building in which the CER has its offices, will save 94,604 litres* of water per year, and reduce the building’s carbon footprint by 63 tons** annually. Any excess electricity produced is fed into the grid for access by Springfield Studio tenants when it is dark, in a system made possible by the City of Cape Town’s small-scale embedded generation programme (SSEG). The switch to solar is an initiative of Heron Square, the owners of Springtime Studios. In September, 127 PV panels were fitted to the approximately 300 square metre rooftop of our building in Observatory, Cape Town, by Solanergy and Solar MD over a period of three days. The new system went into operation on Sunday, 22 October and produces 192 kilowatt hours (kWh) of electricity daily, which is sufficient to power a significant proportion of the building’s electricity consumption each day. Excess electricity generated over weekends or holiday periods is fed into the grid and “bought back” at a reduced rate when Springtime Studios tenants require it to ensure both an uninterrupted power supply, and that every kWh produced by the new system is utilised. “Every South African is entitled to the cheapest, cleanest, greenest electricity. South Africa’s plentiful renewable energy sources – which also don’t cause death and ill health like coal – should be available to all South Africans – particularly as these are officially cheaper than electricity from coal,” says CER Executive Director Melissa Fourie. The CER forms part of the Life After Coal/Impilo Ngaphandle Kwamalahle campaign with partners groundWork and Earthlife Africa Johannesburg. We discourage investment in new coal-fired power stations and mines; accelerate the retirement of South Africa’s coal infrastructure; and enable a just transition to renewable energy systems for the people. * Equivalent to three people’s annual water consumption on current City of Cape Town water restrictions. Eskom’s coal-fired power plants require 1.35 litres of water to produce 1kWh of electricity. ** Eskom coal plants expend on average 0.9Kg of carbon dioxide per kWh produced.